Primewarp: Genesis is a post-cyberpunk game with some unique mechanics that don’t allow us to define a clear type for it. It’s part skirmish for up to 5 players (with expansion), but it also features solo, cooperative and team mechanics, with PvE elements that make the game challenging no matter the number of players. The game is set about 200 years in the future, when a scientific experiment ends badly because of a terrorist attack and opens a way to another universe. This quickly escalates to a black ops war between mighty corporations, the Church and some independent parties, fighting for a new resource known as Majarinthe. A typical tile arrangement 9 8×8″ tiles. Normally the playing area consists of two such maps. Image for illustration purpose only. 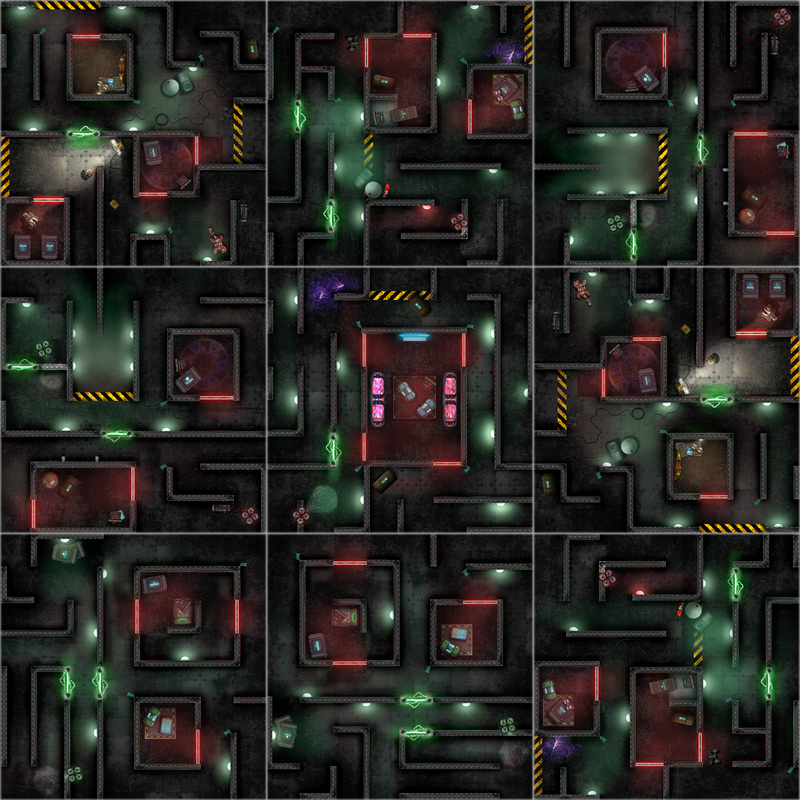 The game features two enormous modular boards (24×24” each, 8×8″ tiles), plenty of miniature models and hundreds of skills, weapons, equipment and upgrades cards, but our pride is that we managed to create a game that offers something truly unique that is much different than the trendy 1 vs. many or coop games, yet also features such elements. 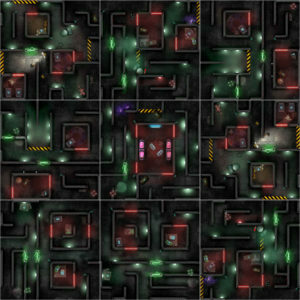 Primewarp is in the most advanced stage of development of any of our games. 100% of the art pieces, 100% of the game tiles layouts, 45% of game tiles artistic touches, and 10 of the 18 possible models are ready for printer. We don’t have approved card layout, and there are around 500 cards in the game. We also prepared some Kickstarter stretch goals in advance, like additional rules, additional 3D models (plastic miniatures), cards enhancing the game, and custom dice (including add-on with different dice for every player). In addition, we made the decision to split the game content into a base game and expansion (Primewarp: Blades and Fire), which would help us add even more content in the paid add-on, and raise more funds during the KS campaign while lowering the base game price in order to make it more accessible. Expected revenue and profit: Primewarp: Genesis is a very big game, and we expect to see a lot of hype around it once we have a pre-production copy and show the gameplay (which we are hesitant to show at this stage, as anything unique will be quickly copied by other studios). We expect the game to raise between $450 and $700 000 in Kickstarter, but we have hopes for hitting a million with this game. 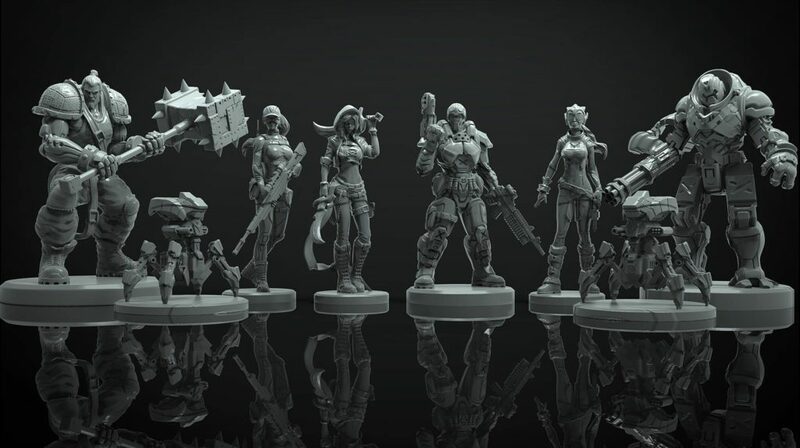 Of course, it costs much more to manufacture it – about $35-40 per box, and the development is much more expensive – so far for the 2D art (characters, card art, tiles basic layouts and tiles additional art) cost is just over $17 000 (already paid), and the 3D models total is $9000 (paid so far $5000) . We will need another $15 000 to finish with the grphics and models and to spent as much on marketing before and during the Kickstarter campaign. Primewarp and its expansion shared profits are set at 40%, and we estimate they would amount to $80 000 to $130 000 at the lowest expected campaign funding, not including wholesale and retail sales.